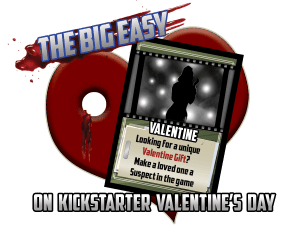 The Big Easy from Last Lion Games launches on Kickstarter at noon Eastern Thursday, February 14, and there are limited* reward levels available to put your friend, family member, or significant other’s likeness on a Suspect card. Gumshoes the world over will seek them out as a femme fatale or tough guy! The Big Easy is a brand new competitive card game for 2–4 players designed by John Goff (Deadlands Classic and Reloaded, Deadlands: Hell on Earth Classic and Reloaded, and many others) and set in the universe of Deadlands Noir. Each player takes the role of a private detective trying to solve a nefarious crime. All players use communal decks as they try to gather the clues they need to solve the mystery. You win the game when you have a Suspect, Motive, and Evidence Clue card in your case file and reveal them to accuse your Suspect of the crime.